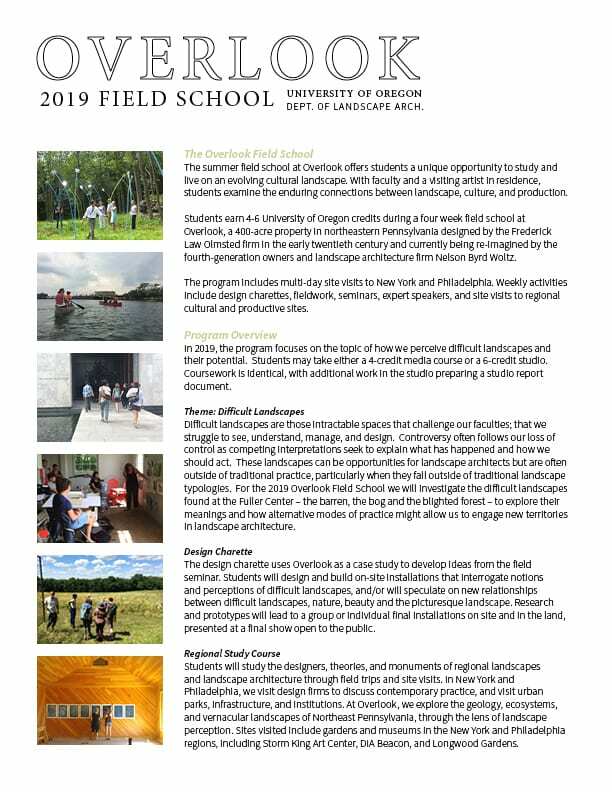 Applications for the 2019 Field School are available online. The deadline for summer 2019 is January 31, 2019 for priority consideration. Students earn 8 University of Oregon credits while living and learning for four weeks at Overlook, a 400-acre property in northeastern Pennsylvania designed by the Olmsted Brothers firm in the early twentieth century, and currently being re-imagined by the fourth-generation owners and Nelson Byrd Woltz landscape architects. The summer field school at Overlook offers students a unique opportunity to live, study and create on an evolving cultural landscape. With faculty and a visiting artist in residence, students examine the enduring connections between landscape, culture, and production. The fully funded program includes multi-day site visits to New York and Philadelphia. Weekly activities include design charettes, fieldwork, seminars, expert speakers, and site visits to regional cultural and productive sites. Difficult landscapes are those intractable spaces that challenge our faculties; that we struggle to see, understand, manage, and design. Controversy often follows our loss of control as competing interpretations seek to explain what has happened and how we should act. These landscapes can be opportunities for landscape architects but are often outside of traditional practice, particularly when they fall outside of traditional landscape typologies. For the 2019 Overlook Field School we will investigate the difficult landscapes found at the Fuller Center – the barren, the bog and the blighted forest – to explore their meanings and how alternative modes of practice might allow us to engage new territories of landscape architecture. Landscape maintenance is a neglected yet essential aspect of the work we do. Together, we will speculate on the social reasons for pervasive attitudes about maintenance, including who does the work, how it is done, and when it takes place. The studio uses Overlook as a laboratory to develop designs integrating landscape maintenance. Students draw, design, and build on-site installations that explore how growth, decay, technology, tools, and labor all influence a design’s life in time. Field research and experimentation lead to an exhibit of drawings and speculative maintenance tools, presented at a final show open to the public. Through local and regional visits, students will study the designers, theories, and monuments of regional landscapes and landscape architecture. In New York and Philadelphia, we visit design firms to discuss contemporary practice, and visit urban parks, infrastructure, and institutions. We visit gardens and museums in the New York and Philadelphia regions, including Storm King Art Center, DIA Beacon, Chanticleer, and Longwood Gardens. Michael Geffel teaches the preparatory spring seminar, and manages the Overlook Field School and co-teaches the summer courses with scholars and artists in residence. Airfare, local travel, housing and meals are paid for by the Fuller Center. Local travel includes the field excursions, including travel, hotels, admission to required sites, and a meal stipend. Students pay tuition for summer credit hours, according to the Registrar’s fee schedule. Students make their own travel arrangements to and from Overlook. A travel subsidy will be deposited to students’ UO accounts. The amount of the subsidy is based on round-trip airfare from Eugene to Scranton, PA, one checked bag fee each way, and round-trip shuttle costs from Scranton to Overlook. Students are eligible for summer financial aid to assist with tuition. Students should follow the usual application process. Graduate students with GTF appointments may be eligible for a “summer sandwich” tuition waiver. See http://gradschool.uoregon.edu/gtf/summer-sandwich for information on the waiver. Graduate students may be eligible for a graduate research subsidy through the Fuller Center; applications and process will be sent to all interested students in winter term. Admission is through the Landscape Architecture department, and considers academic standing and GPA, as well as relevance of the program to the student’s area of study. Submit your application and supplemental materials (2-4 images of sample work) online. January 31 Application deadline for the summer 2018 program. Applications are accepted by the faculty director, and applications will be considered as they are completed. February 15 All students will be notified of their acceptance status. February 28 Student confirmation of offer. All students who are accepted to the program must confirm their participation. If there is a waiting list, students will be accepted from the waiting list following the February 28 confirmation deadline. Those students will then have two weeks to confirm their participation.